Larvae usually attended by ants from five different genera. Chief food plants are members of the Sapindaceae, particularly Cupaniopsis anacardioides. Mature larvae colour varies from green to bright reddish-pink, according to the colour of the flowers and shoots on which it is feeding. 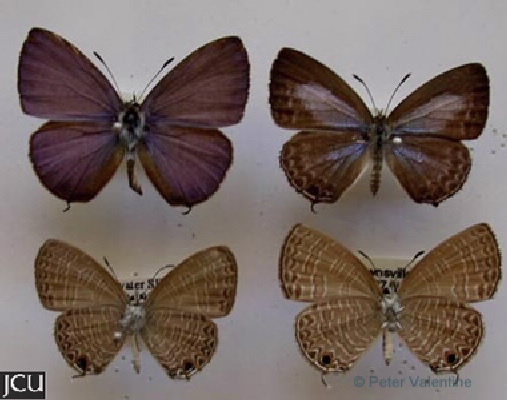 Adult male is dull lilac with a narrow darker outer margin, female is brown black with a blue central area, hind in both sexes has a slender tail; lower surface pale brown with darker brown spots and bands edged in white; large black spot near the tail.